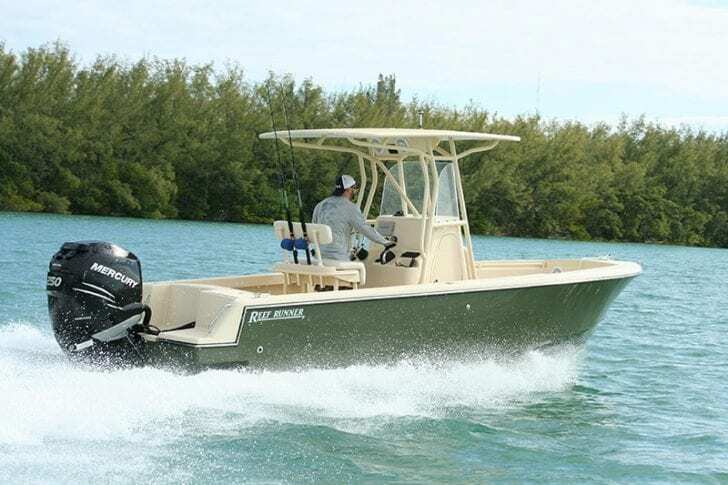 Reef Runner Boats is a homegrown, no nonsense boat company based in Opa Locka, Florida. 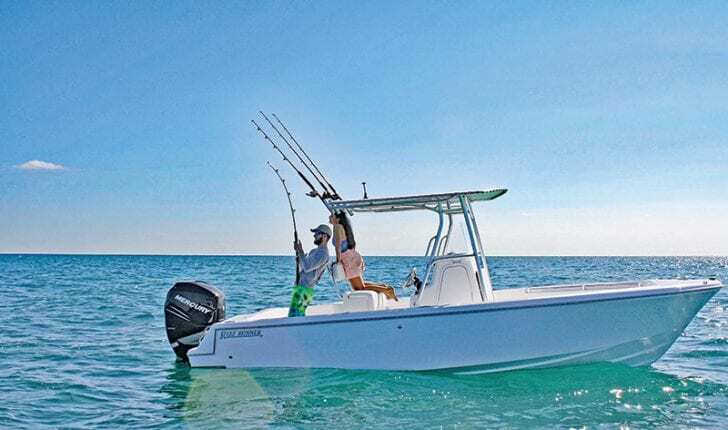 The brain child of Owner and CEO Donna Milo, a local avid boater with boating roots that date back fifty years, Reef Runner is poised to turn some heads in South Florida and beyond. As a custom home builder for thirty seven years and founder of Blue Marlin Towers, Inc. in the 90’s, Donna is no stranger to the marine industry. A passion for perfection and all things boat related gives Donna the focus and ability to consistently produce quality boats. A relationship with Miami based marine contracting firm, Dock and Marine, Inc., led Donna to fulfill a request by Dock and Marine for a fleet of indestructible skiffs. These boats are used as push boats and work in the harsh marine construction field. Capitalizing on this opportunity, a line of pleasure boats with the same backbone as the work boats, but with a fit and finish second to none in the industry was created. Reef Runner Boats operates its facility with a crew of nine. A finely honed team of mold makers, laminators, riggers and finishing team, many of which are cross trained, allows Reef Runner to produce their boats under one roof. Unlike many other manufacturers, none of the lamination or other parts of the build process are subbed out to other businesses. 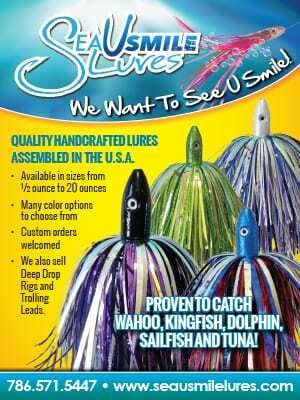 This keeps tight quality control in production, which is evident in their finished product. As of this writing, Reef Runner Boats is moving to a larger facility in Opa Locka where they can develop the 32’ model currently on the drawing board to add to its current fleet of 14’, 18’, 21’ and 23’ center console boats. When you talk to Donna, she will be the first to tell you that it is not all about boats and production. She says, “You have to reflect on where you are and where you’ve been. 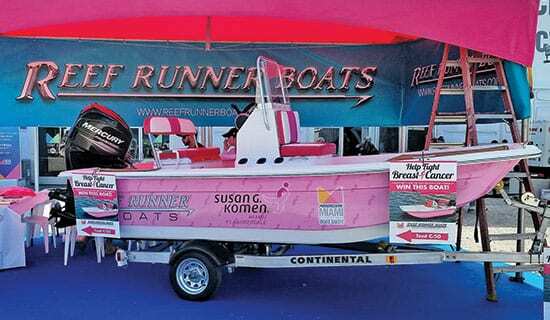 You have to be grateful, but more importantly you have to give back.” Reef Runner Boats put that very philosophy on display this year by raising $10,000.00 for the Breast Cancer Foundation at the Miami International Boat Show and has plans for raising money for Saint Jude Children’s Hospital with a charitable event to be held at next year’s show. The level of energy, commitment and passion felt while visiting with the Reef Runner Boats crew says volumes about where this company is headed. “We are here to stay and here to grow” said Donna’s son Mike Milo, who shares the same passion for boating and is part of the Reef Runner Boats team. “This is a family owned and family run business with a track record of quality builds under our belt” added Mike. With this formula, it looks like Reef Runner Boats is carving out a nice niche, building custom and semi-custom boats in a segment of the market left by the big players as they move to much larger builds in the center console class. The future certainly looks bright for this young and growing company. To learn more about Reef Runner Boats or to schedule a sea trial, give them a call and be sure to tell them that Coastal Angler sent you.